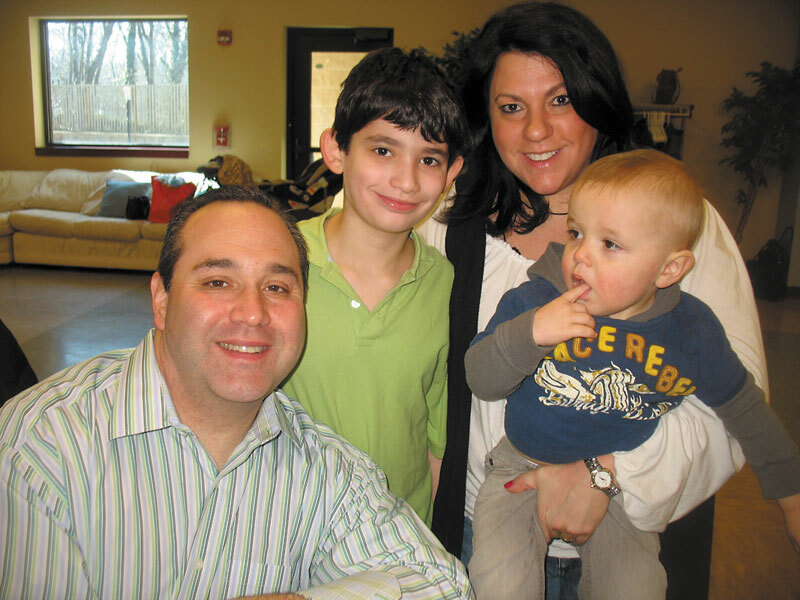 Lisa Marx — shown with her husband, Jason, and their children, Adam and Benji — helped found the adoption group at Congregation Agudath Israel of West Essex. Joyce F. of Montville was shocked when, at her son’s brit mila, the mohel added “ben Avraham v’Sarah” to the boy’s Hebrew name. The phrase, meaning the “son of Abraham and Sarah,” is a formulation reserved for converts. Joyce didn’t realize it would apply to her adopted son. “I was shocked because I didn’t know about that,” she said. Now she has the chance to share her hard-won knowledge with other adoptive parents “so they are not caught off guard,” she said. 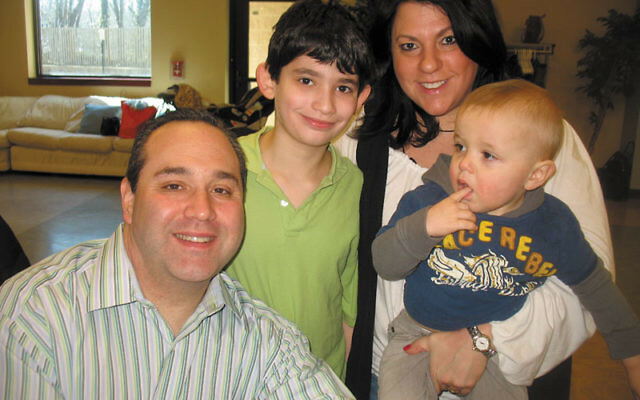 On a recent Sunday morning, she was among the members of about 20 families who had gathered at Congregation Agudath Israel of West Essex in Caldwell for a Jewish adoption support group. The group, led by synagogue social worker Wendy Sabin, started in the fall of 2009. Meetings, held every other month, are usually issue-focused: how to handle the inevitable elementary school family tree project with your adopted children, how to tell your children their story of being born and coming home, what questions they may ask and how to answer. There are about 15 regulars in the group, which Sabin describes as a Jewish parenting group focused on adoption. She started it at the request of several Agudath Israel members who had adopted children around the same time. “I wanted to find a place where I could feel supported and give support to other families who have adopted, so we could build a sense of community for ourselves and for our children,” said Lisa Marx of West Orange. Marx has a biological son and a 19-month-old son who was adopted. On this first Sunday in April, at parents’ request, it was a social gathering. Plenty of toddlers roamed around, chasing toys, climbing onto chairs, and grabbing their parents’ ankles. Four older children relaxed together on a sofa. Parents like Joyce (who asked that her full name not be used) shmoozed. In one area of the room, the conversation turned to international adoptions. “China has slowed down tremendously,” said another woman. “Is Russia closed?” asked Frey. Lauren Markon of Livingston was amazed at how many people had joined the group. “There must be 20 of us between surrogacy and adoption,” she exclaimed. A generation ago, she said, it would be the rare synagogue that would host such a support group. The National Jewish Population Survey 2000-01 found that just over 5 percent of American-Jewish households have children who are adopted — a 2 percent increase since the 1990 survey. Like Marx, Markon and her husband have a biological son who is nine and an 18-month-old adopted son. Joyce F. is among the group’s veterans. Her children are at the older end of the group, and she has insights gained through experience about parenting adoptees. And while she acknowledged that “parenting is parenting” in terms of the development of a child, she pointed out that adopting a child has far-reaching implications for everything from Jewish rituals to routine medical history. For example, she had to get an EEG for her son because she had no family cardiac history for him. When she converted her children, she said, she entered the choppy waters of the “Who is a Jew?” debate. In Israel, for example, the fervently Orthodox rabbinate is trying to limit conversion to a tightly regulated body of Orthodox rabbis. In the end, the children were converted under Conservative auspices. “If there’s a problem, they can reconvert,” Joyce decided. Sometimes, older siblings have their own stories to share. Macen Lantzman, 12, of Livingston has three younger siblings including three-year-old Kai, who was adopted from Guatemala. Now, she said, she hopes to adopt children when she grows up. For her bat mitzva project, she is raising money for the Worldwide Orphans Foundation in Maplewood, started by Dr. Jane Aronson, a pediatrician specializing in adoption medicine. Macen’s mother, Zanna Lantzman, explained that she has always wanted to adopt children. “We had a lot of love and we had the resources. We wanted to expand our family and help a child in need,” she said. So far the family hasn’t had to deal with any significant difficulties raised by Kai’s adoption. “He’s not old enough yet to notice the difference,” said Lantzman. “But as he gets older, I’m sure we’ll have issues — we’ll want to know how to deal with certain adoptive situations. This group will be great for getting advice. Also, we’d like him to know other children who were adopted and are from Guatemala — that he’s not all alone, and that there are other kids like him in his situation,” she said. At the support group meeting, Lantzman and Frey, whose adopted children are from Guatemala, discussed the ways Frey and her husband manage to weave Latin culture and Jewish culture into her children’s identity. “We honor their country,” Frey told NJJN. “Our house is filled with stuff from Guatemala.” This summer, the family will travel to the Central American country where both children will participate in a mitzva project, building a house there for an organization similar to Habitat for Humanity. Although that kind of trip is years away for Kai, Lantzman beamed. “You can see other people who were actually adopted like us and you can see what their lives are like, from different cultures and countries,” he said.